Friday night MLS Soccer action will feature round two of the 2017 Texas Derby in Houston, when MLS sides Houston Dynamo and FC Dallas compete for the 2018 rights to hold El Capitán, a replica 18th century cannon. 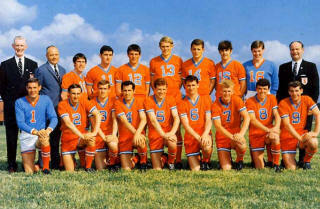 50 years ago on June 3rd and June 10, 1967, the first professional iterations of the Texas Derby were played in Dallas and Houston between the United Soccer Association’s (USA) Houston Stars and Dallas Tornado. Because the United Soccer Association started up with little preparation, the league brought in complete foreign teams to represent the franchises established in 12 North American cities. The Lamar Hunt owned Tornado were actually in reality Dundee United FC, one of three Scottish First Division clubs brought to America for the tournament that summer. 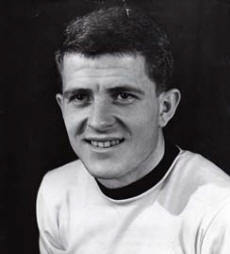 The Dane who scored the winning goal was 23-year old Finn Dossing off an assist from Tommy Millar from 5 yards out. The Mustangs were lacking many of their best players, as they had not even arrived in the U.S. yet, and were outshot by the Tornado 28-2. Dallas goalkeeper Sandy Davie did not have to make a save that day. A crowd of 16,431 showed up to see the opening Derby match between the Tornado and Houston Stars (Bangu/Brazil). The mystery for spectators about this first Texas Derby was expressed in this game report from the Grand Prairie Daily News on June 6th. Imagine how often this mix-up would have aired on SportsCenter or shared via social media if it had happened today. The Houston Stars won their first game of the ASA tournament in the Texas Derby rematch before 20,375 in the Astrodome. Goals were scored by Borges and Peixinho in the first half to secure the victory. The game story from AP has the details below, but in Summer of ’67, author Ian Thomson focused most of his match description on the challenges Dundee United faced playing indoors and on artificial turf for the first time. The Astrodome “soccer” field configuration presented complications for both teams, but especially the visitors. The field surface, set up for baseball a few days later, was a combination of dirt and grass, complete with holes where the bases had been removed. Also in Summer of ’67, Tornado player Mogens Berg attributed part of the issues to not having the appropriate shoes, stating that the Tornado players had not been informed about what type of field was used in the Astrodome before the match: “We didn’t have the right shoes for playing on that.” Because it was there, of course, once the Tornados entered the field they had to organize a competition to see if anybody could hit the roof with a soccer ball, which they quickly determined was impossible. 8:00 p.m. on Friday evening in Houston the inter-state fun continues. I will publish a story on Texas Soccer Journal in July to discuss the final results of the Tornado and Stars in this tournament played 50 years ago this summer. I also highly recommend Summer of ’67-Flower Power, Race Riots, Vietnam and the Greatest Soccer Final Played on American Soccer by Ian Thomson if you would like to learn more about the single season of the defunct United Soccer Association.